The Digital Media Training Program (DMTP) is delighted to announce the launch of an educational initiative called “A Thousand Young Photographers” (ATYP). It’s often said that a picture is worth a thousand words. We intend to train a thousand young photographers and put a camera in the hands of each and every one of them. If children and young adults can frame their world anew, it will change their lives forever. Each new photograph a child takes allows him or her to envision the world with fresh eyes—the eyes of a photographer. Every new photograph a young adult takes allows them to find beauty in the midst of ugliness, hope where there is despair, and artistic expression across even mundane vistas. Within each reframing, a thousand taken photographs will develop a profoundly changed child. Multiply this by a thousand children, and you have a changed world! In short, we fully intend to invigorate profound world change…by developing and skillfully refining the way young people perceive their world—one thousand children at a time. DMTP students photograph portraits with Elinchrome strobe lights at My Image Studios in New York City. Join us in our efforts to bring about positive change. We need digital cameras and accessories including tripods, flash units and computers to put in the hands of our students. If you can help, contact DMTP director Melvin McCray at melvinmccray@gmail.com or (917) 748-4122. Students of the DMTP receive instruction from photographer John Pinderhughes, Garett Ewald and Tim Grey. Click on the photograph to view the gallery. DMTP's mission is to train underserved Harlem youth within the areas of video, photography journalism, 3-D animation and engineering; and to chronicle the rich history of the Harlem community. Former ABC World News Tonight Editor and Columbia Journalism School Adjunct Professor Melvin McCray created the DMTP in 2013 and has since expanded to include engineering and 3-D printing. The program operates under the auspices of the Board for the Education of People of African Ancestry, a Harlem-based 501(c)(3) and receives financial support from the West Harlem Development Corporation as part of a Community BenefitsAgreement between Columbia University and Community District 9. 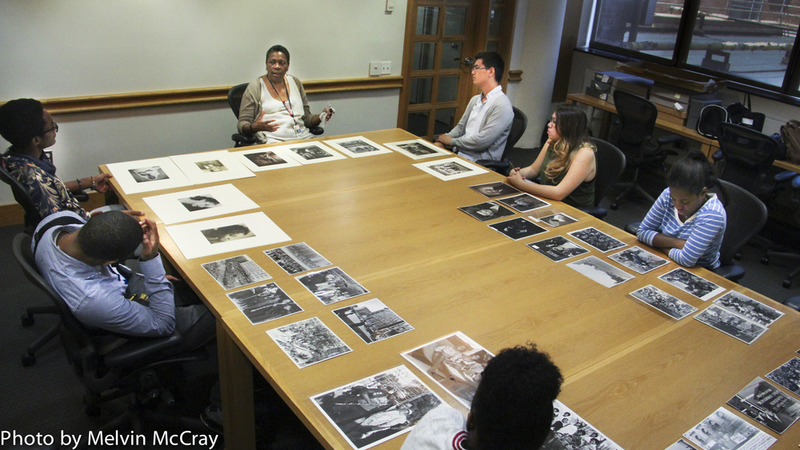 The Schomburg Center for Research in Black Culture Photography Curator Mary Yearwood lectured to the students of Digital Media Training Program about Harlem-based photographers of the past and present. Click on the photograph to view the Gallery.